Data hunters always pay top dollar for old drives. The more useless the data, the higher the payout. What would Daft Punk and Pharrell do? Is Easy Mark good card? What about card that gives you the same to ratio, but take less space in the deck with greater economy effect. But Lucky Find truly shines with Prepaid VoicePAD as a economy engine which rivals Magnum Opus or Kati Jones. Especially with Kate "Mac" McCaffrey: Digital Tinker, who can install PADs cheaper . With three VoicePADs installed late game, you can earn 9 in two turns. From zero! And you can always use it from Same Old Thing to play it from the heap for the 3 clicks total and run on last one in critical situations. Something that can't be done with Day Job. There are also some futher interactions coming our way with Comet, new Shaper which will make event based economy even better. 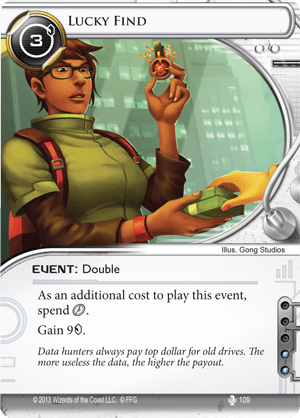 If you have some spare influence points to spend in your deck, Lucky Find can be good option, even without VoicePADs.